Where did this week go? On Friday mornings I take a look at my daily planner and jot down all the things that I didn't get done and try to prioritize what can't wait until next week. Some weeks are better than others. This week has me scratching my head and trying to figure out where I lost a day. It looks like I will be spending a good portion of my time making the phone calls that I put off all week. Not hard calls, just home and family management kind of calls. Why is it that I put off the simplest things? I spent yesterday painting furniture for the booth which is scheduled to open on July 1st. My sister in law came over and we made a good dent in it. Today is all about distressing a few pieces and cleaning up. Isn't this lavender pretty? I have several plants throughout the garden so I decided to clip a few for this photo shoot. This white shelf is one of the display pieces we will be using in the booth. It is one of the steals we picked up a couple of weeks ago for a few dollars at a garage sale. I primed and painted over the dark brown stain and gave it a little distressing with my palm sander. This weekend promises to be one of rest and relaxation. Nothing major planned just a simple dinner with my girls and my grandchildren on Sunday. What about you? Did you accomplish everything you wanted to this week? Very pretty with the lavender on it. Simple, but oh so pretty! Congratuations on your shop. No I never seem to get everything done that I want to for the week. lol. This weekend I have to make myself to stay in (the siunroom) and work on the dollhouse that I am doing for a contest. I don't want to be rushed at the end. procastionation is my name. I wish we had spell check on here. lol. I never accomplish all that I want to. But then, who does? The furniture is looking great! I love lavender!! So pretty, and calming! PS I will be thinking of you and yours on Sunday. Those firsts are all so very difficult. Hugs to you. Nope. Didn't get it all done. But that's why there is next week! In fact, I've got to get on top of my Friday housecleaning chores now! I always have such big plans I never get it all done. Especially not since my camera decided to break a few days ago, so I'm been unmotivated to do things knowing I won't get good pictures with my mom's point and shoot camera. Oh well, that's life. Your lavender is beautiful and good luck with your booth! 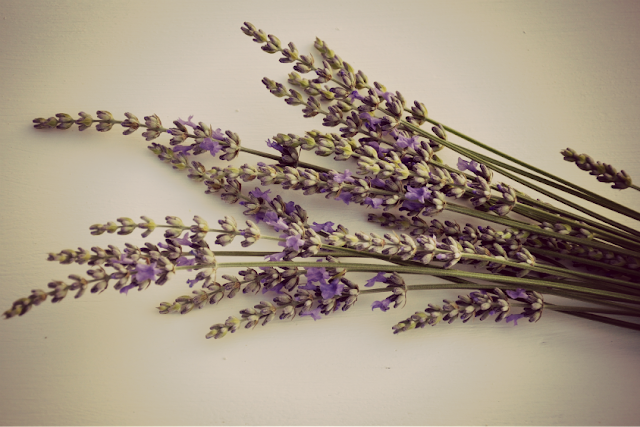 The lavender is sweet, don't you just love the smell!!! I never accomplish all that I want...but then I think I may set too many things to get done!Pretty lavender...I just spent part of the morning dead heading all of ours...we have a huge bush in the front and some pretty good sized ones in the back as well...such a great smell...and filled with so many bees right now! Good luck with the booth!! 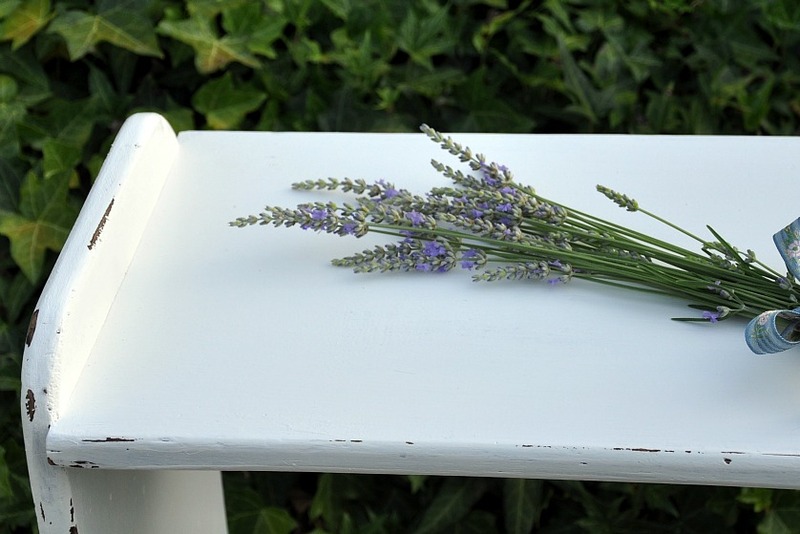 Cute shelf and lovely lavender! p.s. I forgot wednesday was a day this week...just missed it entirely....but did get some painting done! I missed a day this week myself, and yet it seemed like a very long week. Our sweet package arrived! It is so darling! You are so talented. Can't wait for her to wear it. Thank you so much! If I could stay in ONE place I could possible get something done. Joe is taking two blessed weeks off and we will be together at our yellow house. Boy do I have plans. It must be so exciting to be opening a business soon, or rather a second one (given your Etsy shop). I hope both turn out just how you want! Have a lovely weekend, Patty. Thanks for following and I am following right back. 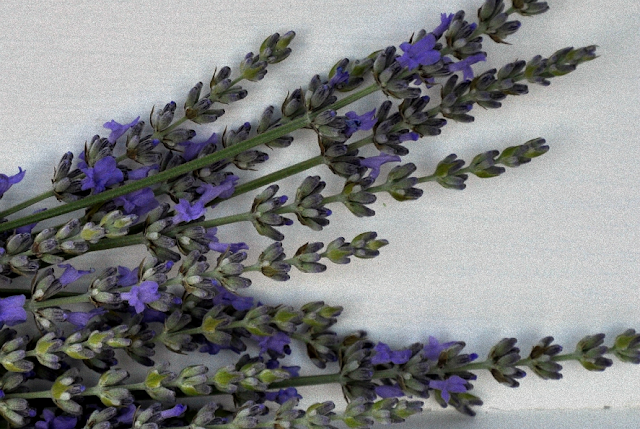 Your lavender is so pretty. The lists get longer, the days feel cramped, but sunshine and fresh air makes me bannish the lists and enjoy. 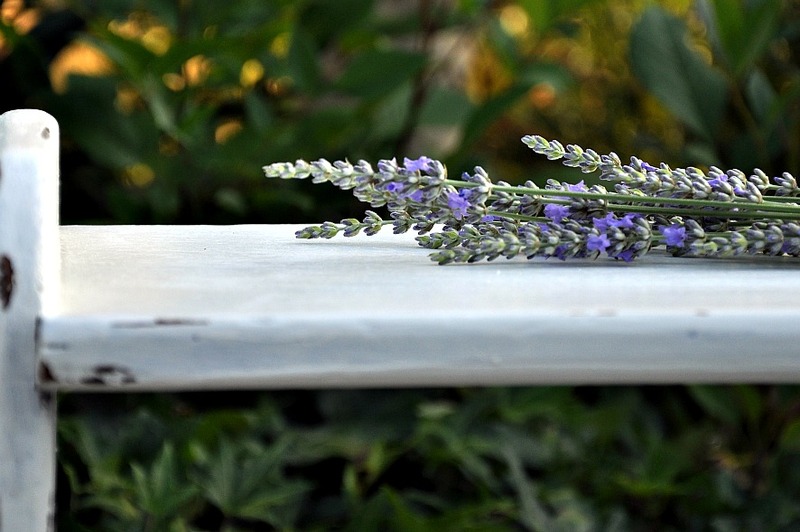 Love your sprigs of Lavender! I got about HALF done that I wanted to this weekend- xo Diana Beautiful images!!! I never get everything accomplished on my weekly list! I'm hoping that'll change once school is out. That lavender looks beautiful! Have a wonderful weekend! Beautiful lavender. I have never had much luck with growing it, but I love it. Your white shelf came out really nice. I loved having an antique booth. Can't wait to see your big reveal on opening day. Nope, I didn't get all I needed to get done this week. I have some very "not fun" paperwork to find for a "not fun" lawsuit and I am procrastenating. But the weekend is here anyway and I have baseball games and a swim meet and then hopefully can spend time with hubby and family for Father's Day. Have a great weekend with your family, Patty. This week did seem to zoom by! Of course, I've heard it said that as we get older, time speeds up.... that explains a lot in my case~~~LOL! 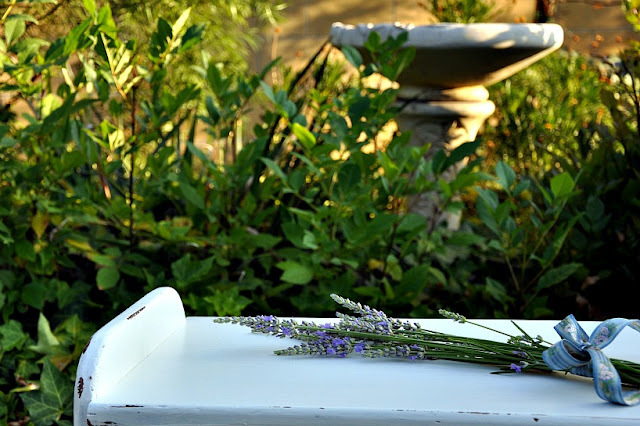 I love the bench and the lavender. This whole month is flying by way to quickly! !!! I have a kazillion projects going on and although I am doing little bits at a time, I feel like I have lost a week somewhere. I am beginning to think that I should of hired someone to help me paint the siding. Sounds as if you're terribly busy getting ready for the booth! These are also exciting times for you with a new adventure!!! I'm spending a big portion of my time this weekend honoring my husband for Father's day with a B~B~Q. Then we'll be preparing for taking a few days off to celebrate my Dad's 90th Birthday! Much success with your booth...the beginning is looking marvelous!!! I think I lose a day most weeks!!! today was our 28th wedding anniversary...and we got a dog, guess that is a lot to accomplish!! Oh how I love to find another kindred spirit...thanks for your sweet note----love your blog. Lavender.....have several little mounds growing at the farm, this will be the first summer with a "harvest". No, but there is always next week! Love your lavender! I have quite a few plants in my yard and they smell wonderful! Do you dry yours at the end of the season?